Engineers at Massachusetts Institute of Technology have developed a new type of glass that eliminates almost all reflection and causes water to bounce off. The team of MIT graduate students, faculty, and former postdoc — now at North Carolina State University — published their findings earlier this month in the journal ACS Nano (paid subscription required). 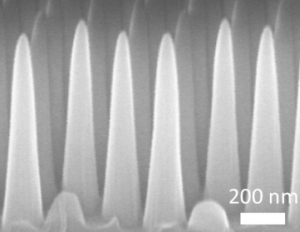 The paper’s lead authors, engineering graduate students Kyoo-Chul Park and Hyungryul Choi, used a process adapted from the semiconductor industry that deposits material in an array of nanoscale cones (pictured right) that are five times as tall as their base width of 200 nanometers; one nanometer equals one billionth of a meter. The team has already applied for a patent on the process. Fabrication begins by coating a glass surface with several thin layers, including a photoresistant layer, which is then illuminated with a grid pattern and etched away. Successive etchings produce the conical shapes. The authors believe the new type of glass can be used in optical devices, smartphones and television screens, solar panels, and car windshields. Photovoltaic solar panels, as Park explains, can lose as much as 40 percent of their efficiency within six months as dust and dirt accumulate on their surfaces. But a solar panel protected by the new self-cleaning glass, he says, would have much less of a problem. Panels made with the new glass would also be more efficient because more light would be transmitted through its surface, instead of being reflected away, particularly when the sun’s rays are inclined at a sharp angle to the panel, as in the early mornings and late afternoons. At these times, conventional glass might reflect away more than half of the light, while an anti-reflection surface would reduce reflection to a low level. Solar panels made with the new glass would also repel water better than traditional glass. While water-resistant glass for solar panels has been developed, the MIT team says the new glass prevents losses of energy due to reflection. Current water-resistant glass panels, like other traditional solar panels, lose energy from reflection of light. Other potential applications include optical devices such as microscopes, cameras, and touch-screen devices to be used in humid environments, where both the anti-reflective and anti-fogging capabilities could be useful. Eventually, car window glass could be developed that eliminated glare, cleaned itself, and prevented fogging up on interior surfaces. Park and Choi envision their new glass being produced by a simple and inexpensive manufacturing process. They note that the shape of the nanotextured surface gives the glass its unique characteristics, not the method of achieving that shape. Thus future glass or transparent polymer films could be manufactured with these surface features, by passing the materials through a pair of textured rollers while still partially molten.